ssc install wid - This installs the WID package in Stata which can be used to extract any of the wealth and inequality data from the WID project. wid, indicators(sptinc shweal) areas(US) perc(p0p50 p50p100 p0p25 p75p100 p0p10 p90p100 p0p5 p95p100 p0p1 p99p100) ages(992) pop(j) - This command extracts the share of income and share of wealth by various groups for the US. To see what all of these options mean, access the manual page for the WID package. save us-wid-data.dta, replace - This saves the data file, overwriting the file if it already exists. For the second part of this exercise, we will use data from the Integrated Public Use Microdata Series. IPUMS provides an incredibly convenient interface for downloading samples of historical federal census data as well as a wide range of other datasets. There are two different datasets that I constructed through IPUMS: 1870-census-wealth-data.dta and 1940-census-income-data.dta. Both of these are available on the course website. You can create your own census extracts using the IPUMS website after creating a free account. 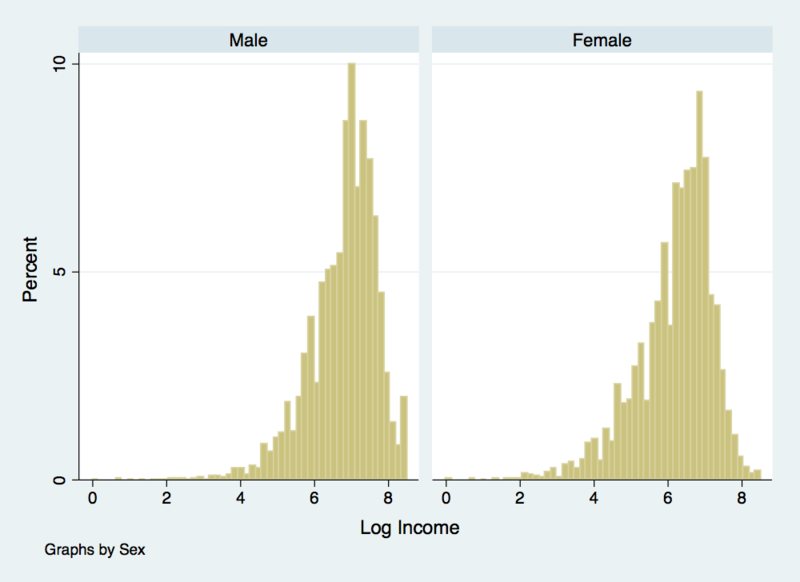 If you are working on your own computer, the WID package is the easiest way to get the wealth and income data in Stata. If you are on a campus computer, Stata will not let you install the package. Instead, you can download a copy of the us-wid-data.dta file from our course website. If you would like additional variables or data from other countries, you can also use the data download tools on the WID website to generate your own samples.
. keep if variable == "shweal992j"
Much easier than having a separate observation for each outcome in each year. One downside of keeping only the wealth variable is that we may want to look at wealth and income inequality trends side by side. We can do this by creating a second dataset with income data and then merging the two datasets back together. First, we’ll save our wealth data and then follow the same steps we took above to create an income inequality dataset.
. keep if variable == "sptinc992j"
Notice that we specified the type of merge, the variable we are merging on and the file name we are merging the current dataset with. Stata has created a new variable named _merge that keeps track of merging successes and failures. A value of three indicates an observation that was successfully merged between the two datasets. A value of one indicates an observation from the master dataset (the one originally open) that could not be merged to the using dataset. A value of two indicates an observation from the using dataset that could note be merged to the master dataset. 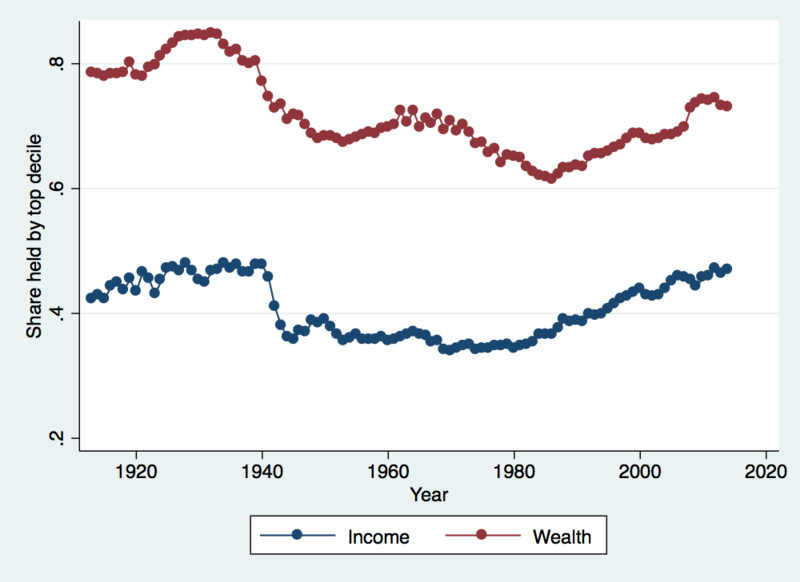 Let’s start by looking at trends in the share of income and wealth held over time by the top decile. To do this, a good approach is to create a twoway graph in Stata. Note that there are many, many options for graphs in Stata and tweaking these options can be very complicated but leads to much better graphs. The easiest approach is to create your first graph from the Graphics menu, selecting all of the various options from the various graphical menus. 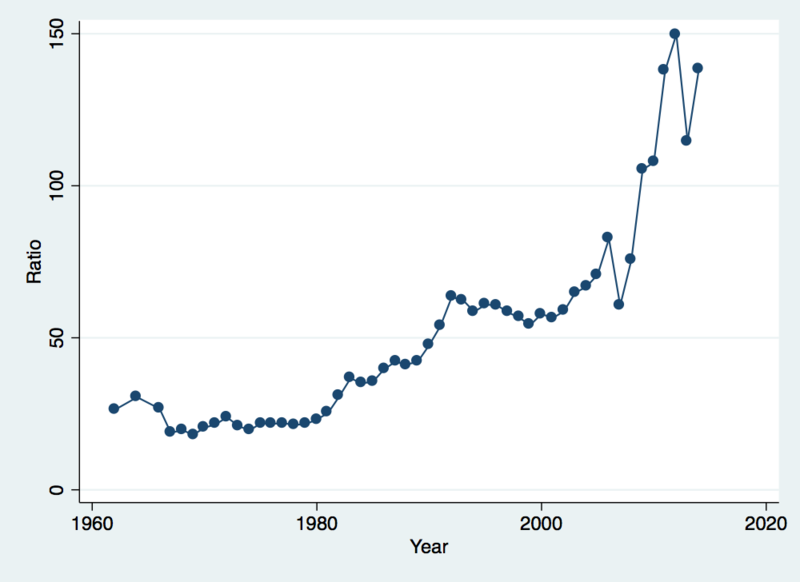 Once you create the graph, Stata will actually issue the command that includes all of your options. You can copy this command and paste it into a do file so that you can automatically create the same graph or slightly modify the command to tweak the graph appearance without going back through all of the menus. Now let’s construct a ratio of the share of income held by the top decile relative to the share held by the bottom decile and graph its evolution over time. Something very strange has happened. The scale has shifted (the ratios on the vertical axis are now much smaller) but the patterns over time are identical to the previous graph. Is this possible? 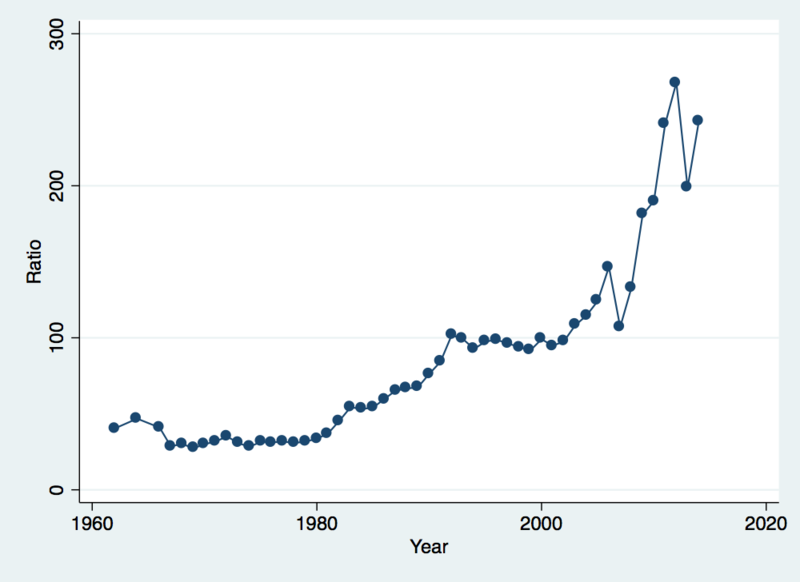 Think about what we discussed in class about top coding incomes and how that might affect this particular graph. Take some time to generate your own samples from the WID data to look at more dimensions of wealth and income inequality over time and across countries. Our share held by the top 10% is simply the sum of wealth given above divided by our original sum. This gives us a share of .8388443. Notice the use of local in the Stata code above. This is taking advantage of what Stata calls local macros. Local macros can be used to store a value that you would like to use later. In this case, I wanted to store the sum of wealth for the full distribution so that I could use it later to calculate the share of wealth. r(sum) is a returned result from the previous command. For any command, you can look at the help page to see what results are returned. division │        Mean   Std. Dev. Freq. Mean real property wealth is highest in the Midwest (the East North Central and West North Central regios) and far, far lower in the South (the South Atlantic, East South Central and West South Central regions). These patterns largely hold for personal property as well, except that New Englanders jump to the top in terms of average wealth. If you think of the occupational and land distributions of these regions, these patterns in personal and real property wealth should make some sense. This gives us a top 5% share of total personal property of 0.746. Repeat this exercise for the other regions and see if the concentration of personal and real property by region matches your priors. Notice that we now have one observation per race per region. It turns out that our median wealth is not all that interesting: median wealth for both personal and real property is zero across all groups in all regions. 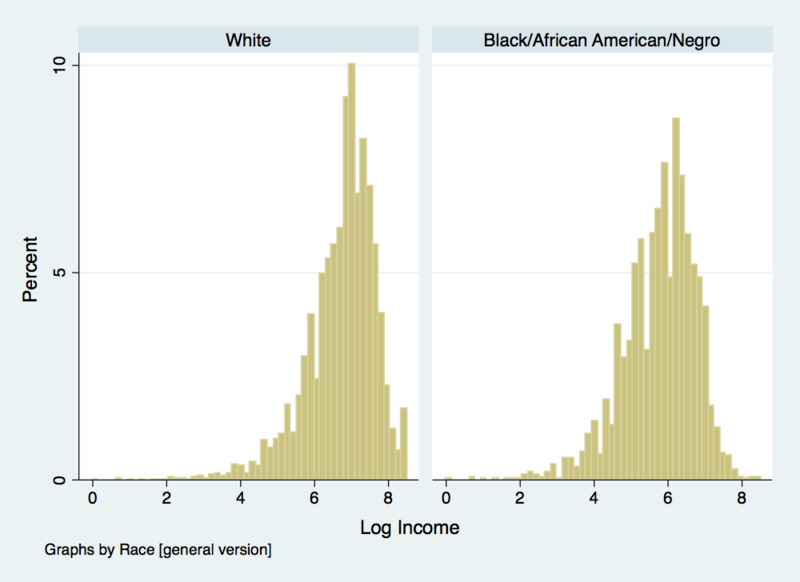 However, the mean wealth data demonstrates the enormous wealth gap between white and black individuals in 1870. You can try collapsing by points in the wealth distribution or collapsing over different geographic areas to explore the data further.
. gen zero_income = 0 if income>0 & income~=. Notice that the fraction of white adults with an income of zero is larger than the fraction of black adults with an income of zero. This might seem odd at first, suggesting that employment outcomes were better for black adults than for white adults. However, there are two other things that may be going on here. Let’s dig a little deeper into the data. Now we are looking just at adult males. Notice that our employment gap has reversed, white males are less likely to have zero income than black males, and our income gap has become more pronounced. The different labor force participation patterns of white and black females have substantial impacts on what the summary statistics look like and any inferences based on those statistics. version] │        Mean   Std. Dev. Freq. We will start by generating indicator variables for several educational categories: eight years or less, some high school, high school grad, some college, college grad.
. gen common_school = 0 if educ~=.
. gen some_hs = 0 if educ~=.
. gen hs_grad = 0 if educ~=.
. gen some_col = 0 if educ~=.
. gen col_grad = 0 if educ~=. Notice that I included all of the indicator variables for education levels except for high school grad. In general, when you are including indicator variables to capture different values for a categorical variable, you must omit one indicator. If you do not, you will run into a big problem of multicollinearity and the coefficients cannot be uniquely identified. In practice, Stata will drop one of the variables in this case so that the regression can be run but it is nicer to choose for yourself which category to omit. The coefficients on the included indicator variables then measure the difference in the outcome relative to to the omitted category. So in this case, the coefficient on col_grad is measuring the additional earning for a college grad relative to a high school grad. Now we get college education premiums that look a bit more reasonable.